I went a bit crazy at the shops the other week and bought 4 quince. 4 HUGE QUINCE. I wasn't really interested in making something deserty, so decided to make quince paste. 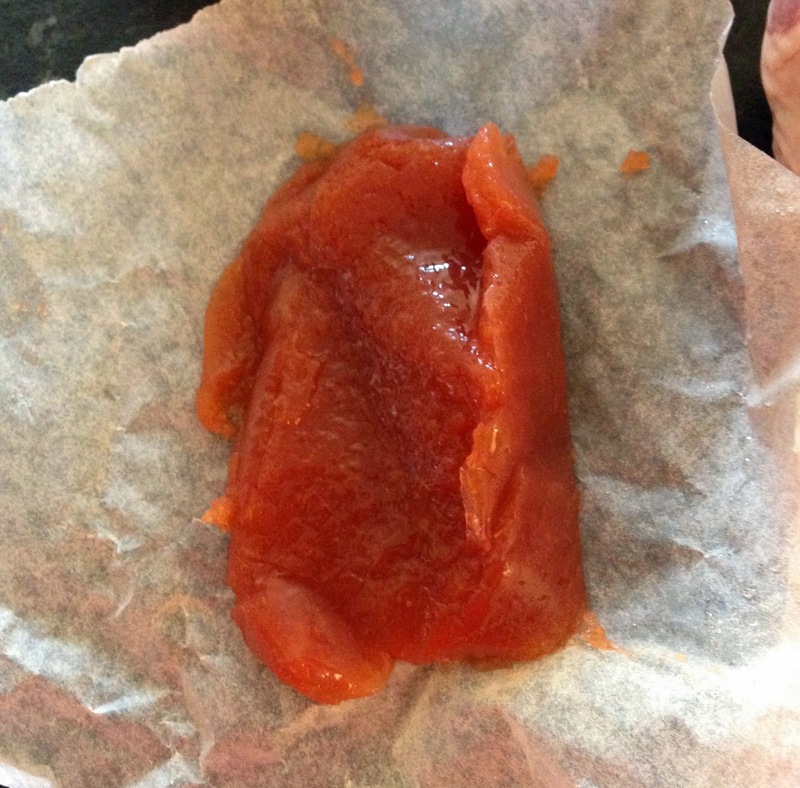 I didn't contemplate beforehand how much quince paste it would actually make . . . . . . So after giving some away, I still have a stash of it in the fridge. 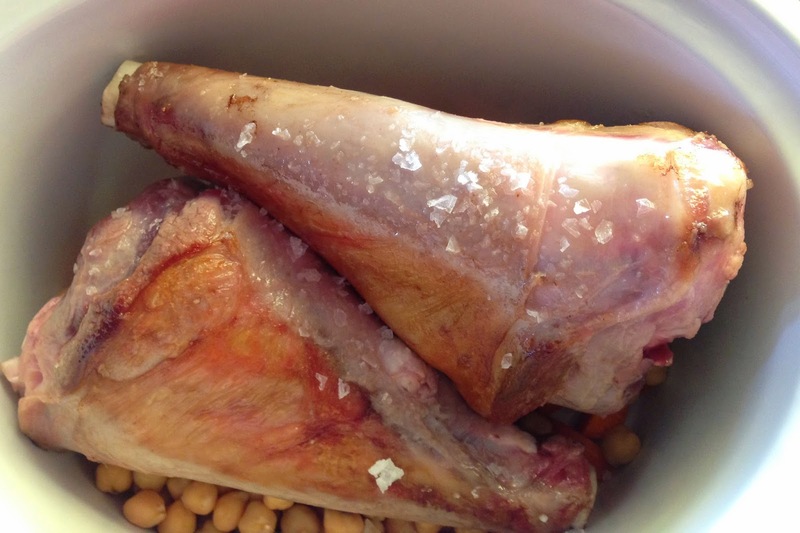 Lamb shanks were a bargain buy last week, so quince paste and lamb shanks it is! 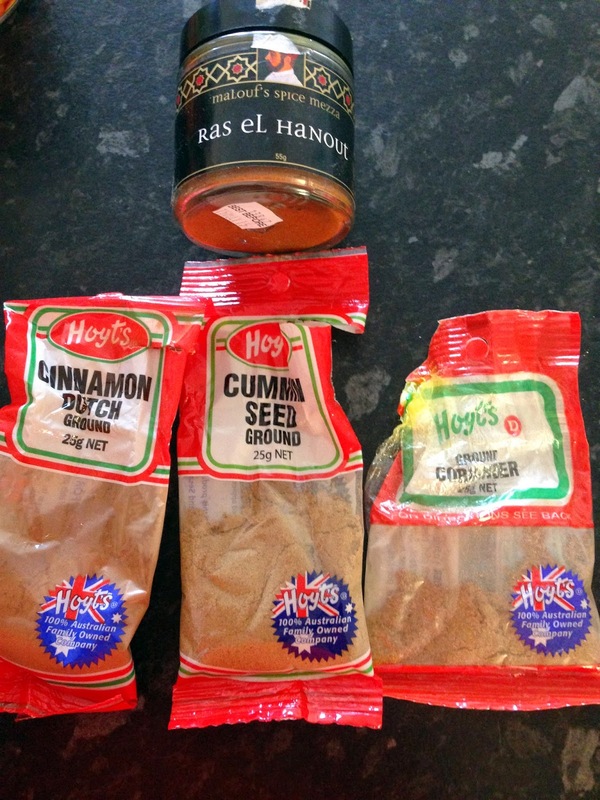 I have been loving Moroccan spices at the moment so decided to chuck some Ras El Hanout in to flavour it as then it reminds me of a tagine with the awesome mix of slow cooked meats, some sweet fruit and spices galore. So, if you feel like a super easy, but tasty meal, read ahead. 1. Turn slow cooker on. Drain chickpeas and place in bottom of slow cooker along with chopped carrots. 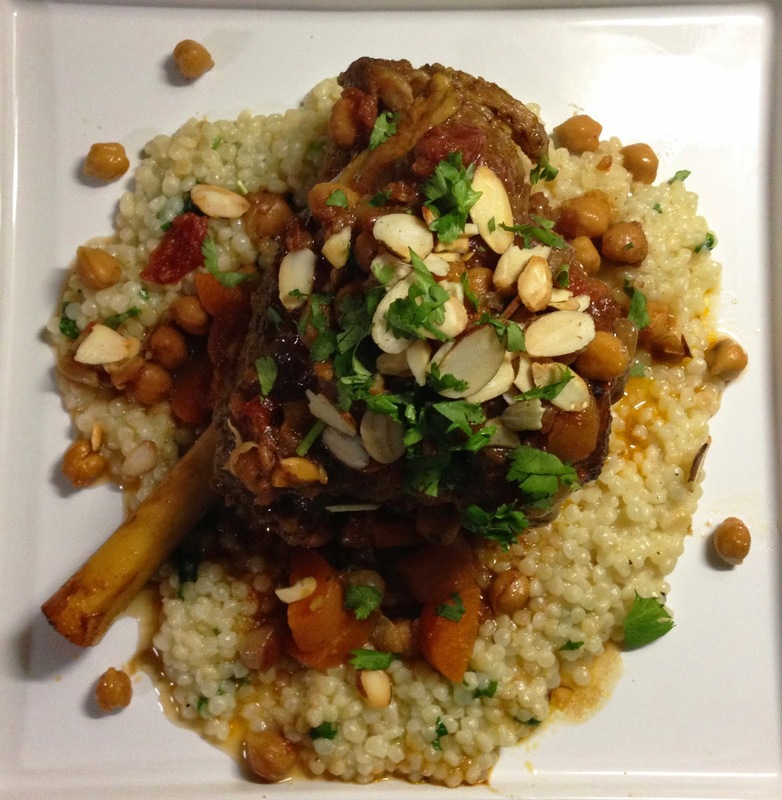 Heat up a non-stick frying pan, pour in a little olive oil and brown off lamb shanks. 2. 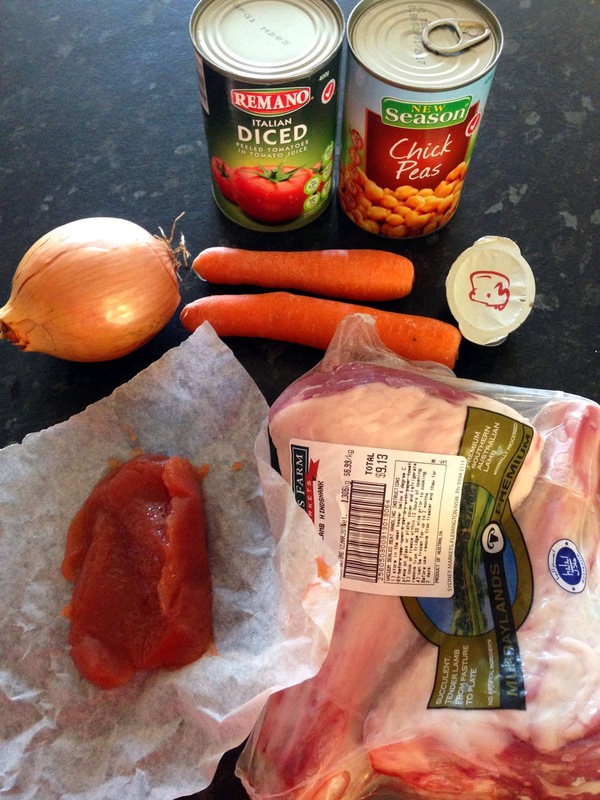 Place lamb shanks on top of chickpeas in slow cooker. Using the same frying pan cook onion until softened and then add in spices. Toast spices for around 1 minute, then add in beef stock and quince paste. Stir until quince paste is dissolved and then add tomatoes. 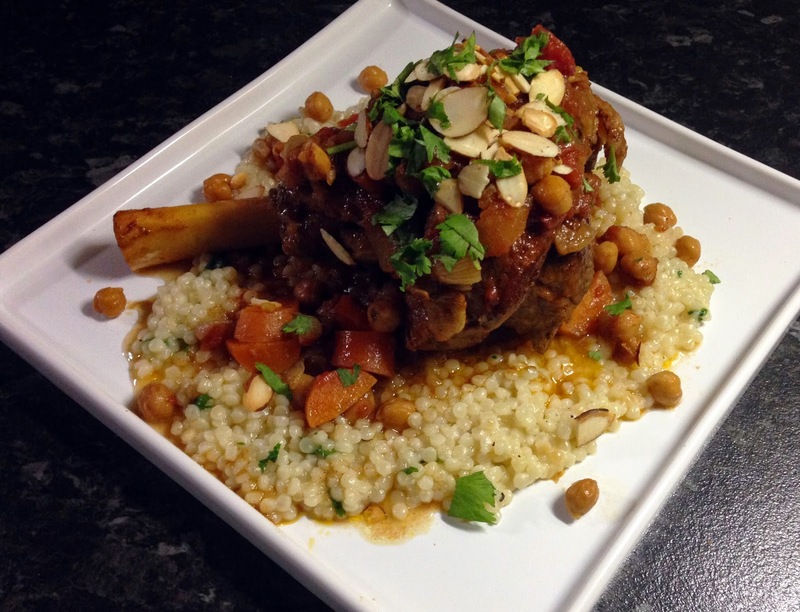 Leave on heat until warm and then pour over lamb shanks in slow cooker. Put lid on and cook for 8 hrs on low or 5 or so hours on high (or until the lamb is falling from the bone, it will differ from slow cooker to slow cooker). I often liked to leave the lid off for the last 1-2 hours to help some of the liquid evaporate and thicken the sauce. 3. Bring salted water to the boil in a medium saucepan and add pearl cous cous. Simmer for 4 minutes and drain, making sure to reserve about 1.5 cups of the cooking liquid. Add butter to saucepan and melt, then add garlic and cook until softened and fragrant. Add in pearl cous cous and 1 cup of the cooking liquid. Add salt and pepper to taste. Simmer for another 4 minutes or until al dente. When done, stir through coriander. Sprinkle with coriander and toasted almonds. You could use a few different things other than the pearl cous cous i.e. regular cous cous, pasta, mashed potato. If you don't have a slow cooker, this could easily be made in a dutch oven, cooked for round 3 hours at 160 degrees. Bellabox April 2014 . . . . . . .